Illinois has a budget for the first time since 2015. On Tuesday the Democrat-controlled Senate voted to override Gov. Bruce Rauner’s veto of the proposed budget. On Friday, July 7, the Democrats in the House, supported by 10 Republicans, completed the task, and rejected the governor’s rejection. The controversial budget includes a hefty 32 percent tax hike. Individual rates will rise to 4.95 percent from 3.75 percent. Corporate rates rise to 7 percent from 5.25 percent. “This tax hike will solve none of our problems and in fact, long run, it will just make our problems worse,” said Rauner. Rauner campaigned hard for spending cuts, a property tax freeze, term limits, and budget reforms. While the budget battle stretched on for two years, Illinois’s economy suffered. With no budget, bills were either not paid or paid by court order. The state owes $14.7 billion in unpaid bills. Respected bond-rating service, Moody’s Investors Service, rates Illinois’s bond at one step above junk bonds. If the state had failed to pass a budget, the rating would have fallen. Moody’s told the state that it would hold off on dropping its rating to “junk,” the lowest possible, but if after a month the state is not able to get a handle on expenses, the bond rating might drop. If the bonds ratings dropped, the cost to borrow money would rise. Illinois would need to pay more money for every debt it owed, and as the interest on the unpaid bills rose, so would the interest on the borrowed funds. States have gone bankrupt before. Illinois is in no way immune. The drop in bond rating was no doubt a powerful argument for action in the minds of some lawmakers. “We have 125 billion dollars in back bills to pay and we have accumulated $800 million in interest on those back bills,” he stated. That amounted to piling $800 million on the floor and burning it—it did no good for Illinois taxpayers, it was pure waste. He pointed out the impact of lowered bond ratings, calling it a “debt spiral.” Debt would rise, as would interest rates, which would drive up debt, which would force more borrowing at an even higher rate, which would increase debt … . “To me, enough is enough,” Harris said on the floor of the House. “I was not elected as a state legislator to help preside over the financial destruction on this great state. 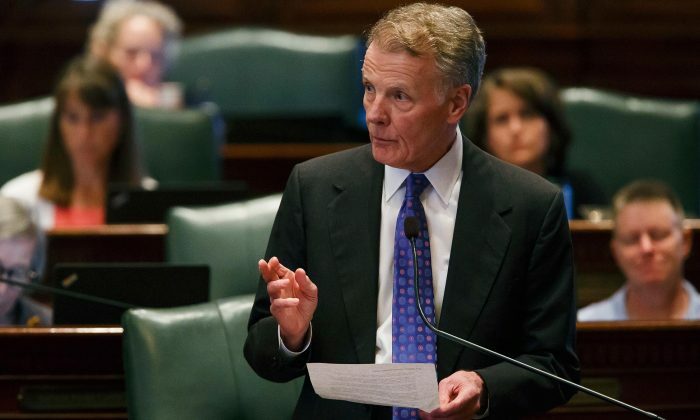 Even with the new budget in place, the state comptroller said Illinois will be $185 million short of what it needs to cover basic expenses in August. The state still faces a $6.2 billion annual budget deficit. Billions of dollars worth of road construction is shutting down. State universities are so underfunded that loss of accreditation is a fear.